After a misadventure with Apple's top-of-the-line 5K iMac, the iMac Pro is proving to be the perfect studio machine for podcasters. Last month, we left our hero weighing his options, considering replacing his i5 Late 2015 iMac with 5K Retina display with an iMac Pro. After I wrote that column, Apple released final pricing details on the iMac Pro, so I sat down with my budget, a spreadsheet, and Apple.com loaded in my browser. It didn't take long to realize that I had made a mistake. My initial plan was to pick up a 10-core model with 64GB of RAM, coupled with a 1TB SSD and the entry-level GPU. It seemed like the most well-rounded machine out of the near-countless possibilities that Apple's online configuration tools allow, but at $6,599, it wasn't something I could afford. I knew the $4,999 entry model was the only iMac Pro I could both justify and afford. The standard iMac Pro is still a lot faster than my 2015 could ever be, but then I started looking at a fully loaded 2017 5K iMac. If I opted for third-party RAM, I could pick up a 4.2GHz i7 iMac with a 1TB SSD for $3,099. With this iMac, I would still have a noticeably faster machine on my desk, but with a lot more cash in the bank. I decided to take the conservative route, so I ordered the regular iMac. It showed up the day after Christmas. I slapped 32GB of OWC RAM in it — for a total of 40GB — and migrated my data from my trusty 2015 model. Unfortunately, it didn't take long to realize that I had made a mistake. Even during the migration, I could hear the new iMac's fan blowing, and once I was logged in, it was even louder. After any data migration, a Mac has a lot to do behind the scenes. Photos.app was busy reindexing my library, and Dropbox was working hard to make sure everything in its folder was supposed to be there. I let things run over night, thinking that by the next morning, this new iMac would be as quiet as my old one in normal usage. Sadly, that wasn't the case. I've heard very mixed things about this from people on Twitter and friends with 2017 iMacs, so I can't say this is a universal truth, but the Core i7-powered iMac on my desk seemed to ramp up its fan far more often than my older i5, and when it did, the noise was noticeably louder than before. When running HandBrake, the fan on my 5K iMac would always crank up and was quite audible when it did so. So far as I can tell, the iMac Pro's fan may always be running, but it's amazingly quiet. In my normal office environment, I can't hear it—only when I spun the iMac Pro around and listened with all other devices off could I hear it, faintly blowing. When HandBrake was running at full speed, the iMac Pro sounded pretty much the same—but the air coming out of the vents on the back was definitely warmer! That did the traditional iMac in for me. I felt as if I couldn't trust the machine to stay quiet when I was recording podcasts or shooting video in my small studio. I needed a computer that would only be loud when I pushed the CPU; the 2017 would spin its fan up with no obvious reason. I found myself popping into Activity Monitor to find some system process using 50% of the CPU, making the fan spin up. So at the very end of the year, I returned my 2017 iMac and walked out of my local Apple Store with the standard configuration iMac Pro. At $4,999, it is the most expensive computer I have ever owned by a healthy margin, but in the week or so I've had it, I have been very happy with my purchase. It doesn't blow away other iMacs in single-core tasks, but most of what I do is multi-threaded. Thanks to the 8-core Xeon CPU, it destroys my old iMac when it comes operations like podcast MP3 encoding and running my noise cancellation application, iZotope. Even under load, this iMac Pro is silent. Like Snell wrote on Six Colors, the fans seem to spin all the time, but Apple has the machine tuned in such a way that they don't really ever speed up; the exhaust air just gets a little warmer. With my microphone less than a foot away, I don't have any fan noise in my recordings. That's a big win for me. In the base-model iMac Pro, I have the slowest computer that will ever be fitted to this cooling system. In the i7 2017 iMac, I had the fastest computer ever coupled to its cooling system. I prefer having the headroom the iMac Pro provides than running a system that sure seems like it could use a second fan. I have several podcast-making friends who are switching to the iMac Pro. It really seems to strike the right balance between performance and usability for those of us who use Macs to record and edit audio on a regular basis. I still have my concerns about the iMac Pro. How will this machine fare over the next 2-3 years? Will it remain nice and quiet? If I want to upgrade the RAM at some point in the future, how much will Apple charge me? Will the company be able to update the line over time, or will the iMac Pro become stagnant over time? I don't have those answers today, but what I do have is pretty great: the fastest Mac I've ever owned, buttoned up in the all-in-one design I've come to love over the years. It's quiet, it's in Space Gray and it makes my work more efficient and less frustrating. 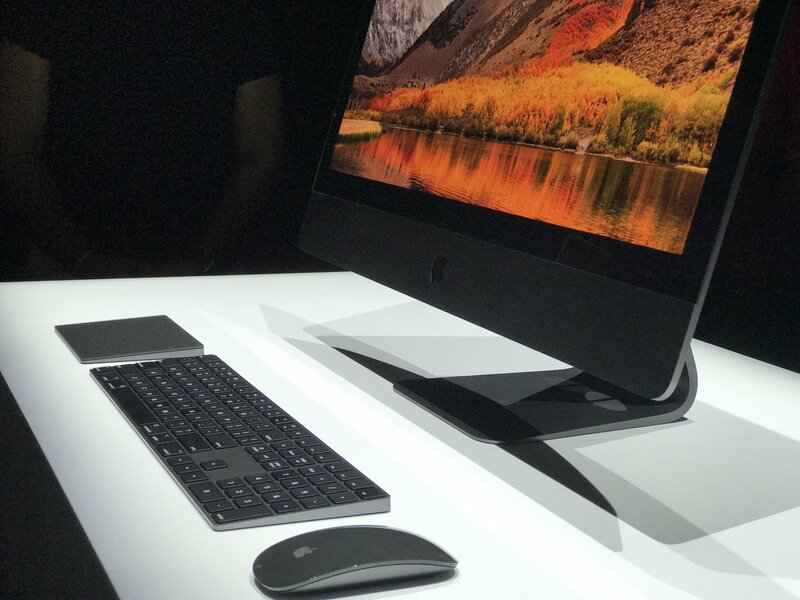 iMac Pro rumors: Everything you need to know! iMac vs iMac Pro: Should you wait? VR for Mac FAQ: Everything you need to know! Stephen Hackett is the co-founder of the Relay FM podcast network. He's written about Apple for seven years at 512 Pixels, and has more vintage Macs than family members living in his Memphis, TN home.